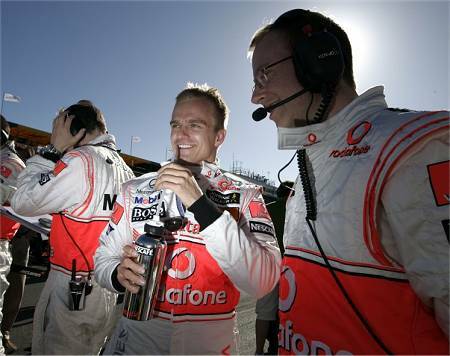 Once again McLaren has been dumped in the mud by an employee - Dave Ryan's suspension, followed by Whitmarsh's apology for the lie told to the stewards hearing in Melbourne, inevitably brings to mind Coughlan's stupidity in the "spygate" affair. We can point at the incompetence of the stewards in not considering all the available evidence before penalizing Trulli, but the fact remains that they were misled by a McLaren employee trying to keep an extra championship point by lying and a driver who foolishly did as he was told. "Okay, Heikki, here's the plan - retire on the first lap and then the stewards won't be able to penalize you..."
There is something wrong in the team's employment policy, that is clear. Maybe it is a function of large organizations that the head honcho cannot keep a lid on all the actions of his employees, perhaps it is the result of a culture of secrecy, paranoid about giving away truth that might be used against the team, it might even be that employee selection processes do not include a concern for ethics. But something is wrong, somewhere. It may be that McLaren has been victimized by the FIA in the past; I think a comparison between the transcripts of the McLaren and Renault WMSC hearings gives good reason for believing so. But that requires that the team be so squeaky clean that no mud will stick and this latest affair proves that the lesson is still to be learned. It would help McLaren supporters enormously if the team were proved right occasionally. Part of the problem is the team leaders' attempts to avoid direct responsibility when caught out. Martin Whitmarsh's statement yesterday was an evasion that must have embarrassed him no end when the FIA produced the radio transmission to prove that the team's representatives had deliberately misled the stewards. How much easier things would have been if he had just admitted the fault then and sacked Ryan immediately. I am left shaking my head at the inability of the team to learn from past mistakes. McLaren was unfairly dealt with in the spygate affair and suffered innumerable incorrect stewards' decisions last year but their handling of controversy is poor, to say the least. As a result of an incredibly bad decision by one employee, a minor matter that should have been dealt with and forgotten very quickly has been blown up until it threatens even the participation of McLaren in F1. Martin Whitmarsh should accept responsibility and then hammer into his employees' heads the idea that only the truth will do. It remains true, however, that the stewards and their interpretation of the rules have become so unpredictable that none of the teams can be sure that they will not find themselves unfairly penalized in the future. McLaren's transgressions have obscured the fact that the stewards made more than one very dubious decision in Adelaide (will we ever get to hear what Donnelly said to Vettel, one wonders). For too long the sport has suffered from such apparently irrational decisions and it is time that competent and qualified stewards were appointed. It is good that the FIA has adhered to its promise to release transcripts of the evidence in stewards' decisions but this applies only to the McLaren case so far. As well as showing that McLaren acted incorrectly in the hearing, the evidence also shows that the stewards made a decision without consulting all the evidence available. In view of this, we are entitled to wonder why the evidence in Vettel's case has not been released and to suspect that the reason is because the decision was as incompetent as usual. Keith Collantine has examined the weaknesses in the decision-making of the sport in his article entitled "Two sides to the Hamilton-Trulli controversy: Another avoidable crisis" and I will say no more on that subject. But it is clear that the sport has a long way to go to clean up its own act so that such fiascos do not occur again. The best that can happen now is that the Hamilton/Trulli debacle be put to bed and we all move on to the next race. Finally, a brief word in Dr Mario Theissen's ear: I see that BMW has tagged on to the teams protesting against the double diffusers. My advice is, "Don't do it, mate - FIA politics is a dirty game and it's best to stay out if you can." There is a partial transcript of the FIA interogating Martin Whitmarsh, his answers are "wishy-washy" at best. Some blogger deemed then "deliberately unhelpful" and I concur. Hamilton's own words (radio transmission) "I've let him past already" sealed his fate. Why did he tell the stewards I DIDN'T let him through? Did Ryan entice Hamilton to "follow my lead" and we can save your place (and an extra point)? When did Whitmarsh know this and why didn't he come clean in the interogation? It's hard to hang ALL of this on Hamilton, it seems to be a TEAM problem. And perhaps the FIA realized this, hence McLaren et al were excluded. A sad day for the silver & red but they seem to have done it to themselves, at least this time. I would actually say that Hamilton is a relative innocent in all this. He did what he was told to do and as he had just got out of his car and went staight to the stewards I would imagine that he assumed that Ryan had thought everything through fully and as a driver I assume that you have to trust the team around you to make the best decisions. Clearly Hamilton could have argued with Ryan about this but then he had just finished a very hot long race and was probably still very confused as to what had actually happened regarding the rules. Also I have heard comments about mclaren telling a white lie in order to secure what was rightfully theirs in the first place. History has taught us that this is a common occurence when people are forced against a seemingly impentrable wall of rules. For instance the Police in the case of the IRA birmingham pub bombings added to the evidence to make sure that those that they knew were guilty could not find a way around the rules to get free. However the common mistake is that if you are found out things are made much worse. In the Pub bombing case the guilty guys walked free and as heros in the mclaren case they lost all their points instead of just 1. It is not excusable but it is at least partially understandable. Donnelly should not even be talking to Vettell! He is not a steward and his messing could be the ultimate reason that the stewards decisions are such a mess. Number 38: I don't doubt that it is a team problem. Hamilton is a McLaren team player and merely does as he's told. Blame for the incident lies upon Dave Ryan for deciding to lie and telling Hamilton to do likewise but there is something wrong in that Whitmarsh felt it necessary to try to cover the mistake until it was no longer feasible to do so. The team's salvation lies in speaking truth, even when they think it might hurt the team to do so. In the long run it pays off. Lee: Donnelly is the adviser to the stewards and I suppose it was in this capacity that he spoke to Vettel. It is interesting in that it indicates that Donnelly had something to do with the stewards' decision, most probably a lot. As Max Mosley's right hand man, he represents the views of the FIA and it is quite fitting that he be called upon to justify the worst decisions of the stewards therefore. I have started keeping my own score card since Spa. I have no interest in ex post justification of anything (everyone bends the truth to their advantage -you would think most of the people making comments on various F1 sites spend all their free time helping old ladies cross the street !!). I only look at the race (huge limitations I know) and a few relevant You tube showings after the event and sensible commentators views on the difficult areas during the race. It appears to me a far more satisfying method of enjoying the sport without getting involved in FIA machinations. So here goes for Melbourne. Button, RB (lucky boy!! ), Hamilton, Trulli etc. Also thought Vettel was unlucky on a racing incident penalty but should have been fined/demoted 5 places next race on safety grounds. A very sensible attitude, KP and I agree with your finishing order for Melbourne (as well as the old lady comment). You must let us know who the real champion is at the end of the year! I think the problem with Mclaren must come from the top, whoever is paid to be on the other end of Lewis's radio should have been able to tell him it was a legitimate move on Jarno immediately. As for running off to Whiting, anyone with a memory stretching back to Spa would know what a waste of time that is! McLaren has always backed down in front of the FIA with the predictable result that they are so scared of making a punishable error they act like frightened rabbits caught in headlights. Their stupid and pointless lie to the stewards has conveniently allowed everyone to forget that a, Lewis was perfectly right to pass Jarno for third, b, Jarno was wrong to re-take the position. And F, any sensible team of stewards would have just shuffled them around 3rd or 4th after speaking to them both........Just after making Vettel and Cubica shake hands! True on all counts, I think, Chrisess. And I love your suggestion for stewards decisions - direct, no nonsense and appropriate! Once again after careful investigation, the stewards have found the worst possible solution and applied it, days after the race. There are many things I loathe and despise about NASCAR and the IRL, but the race director of either of those organizers would have checked the video, told Jarno to let Lewis re-pass and had the field in proper order for the finish with nothing further said about it. F1 officiating is simply a joke. Max and Bernie should swallow had, find an ex-driver they can live with, someone who knows what's involved in the heat of the moment, and just make him the rules czar. Fast decisions, no appeal, and on to the next race my lads!! My opinion does not change. The Stewards have created this whole mess by not reviewing all information available to them prior to issuing their decision. Since they act like judge & jury, they'd do well to remember than in a 'real' court (as opposed to the Kangaroo ones the FIA is so fond of) this would be declared a mistrial and no one would be found guilty of anything, and the race results would stand as they crossed the finish line. Lonnie: The best thing "Max & Bernie" could do is commit Hari Kari! Lonny: Agreed (to both comments!). Peril: You're probably right, although there would be a small matter of perjury mixed up in there somewhere. But this is not a court of law and the stewards are certainly not court judges. The whole thing has been blown way out of proportion (as usual).